From left: Senior Director Workforce Development and Employment at HEART, Denworth Finnikin; Regional Director in the Ministry of Education Region 3, Maxine Headlam; Custos of St. Ann, Hon. Norma Walters; and Executive Director, HEART Trust/NTA, Dr. Wayne Wesley, look at the plaque and new logo of the HEART College of Hospitality Services. 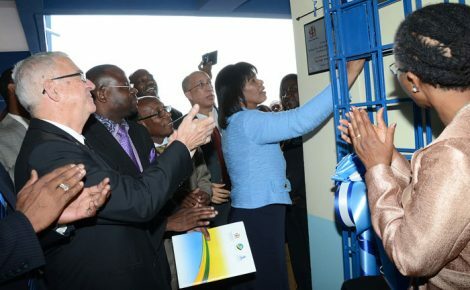 Occasion was the official renaming ceremony of the Runaway Bay HEART Hotel and Training Institute, held on Thursday (Feb. 20) at the facility in St. Ann. The institution has been renamed "HEART College of Hospitality Services". Previously offering levels one and two training only, it will now provide training at levels three to five, with entry level offerings in specific areas. The Runaway Bay HEART Hotel and Training Institute, the premier hospitality training institution in the island, has been renamed the HEART College of Hospitality Services. 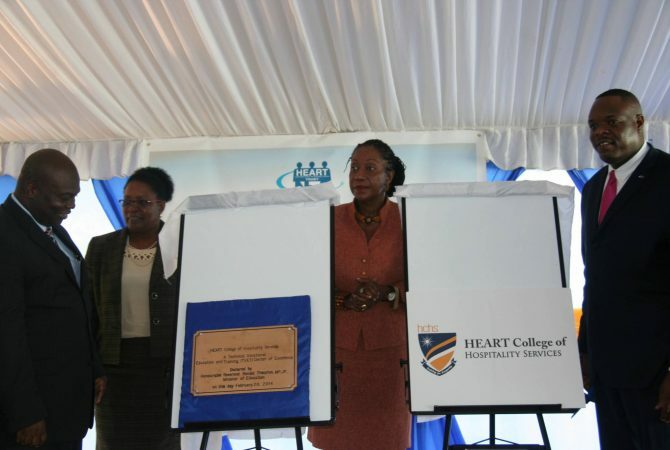 The name change reflects the 27-year old institution’s new college status, and strategic focus aimed at enhancing its contribution to national development, and the realization of the Vision 2030 targets, said Executive Director of HEART Trust/NTA, Dr. Wayne Wesley. Dr. Wesley, who was addressing the renaming ceremony held on Thursday (Feb. 20) on the institution’s St. Ann location, stated that the HEART Trust is cognizant of the dynamic nature of the hospitality industry, and as such, has sought to achieve continuous integration with industry partners to ensure its training and certification offerings remains relevant to the industry. “The institution has transformed into a centre of excellence through strategic partnerships with local and international entities, including the Culinary Institute of America, The American Hotel and Lodging Association, and the Culinary Federation of Jamaica. It is now at the threshold to take a giant leap to expand its offerings to the hospitality sector,” he stated. The institute, which previously offered levels one and two training only, will now provide training at levels three to five, with entry level offerings in specific areas. 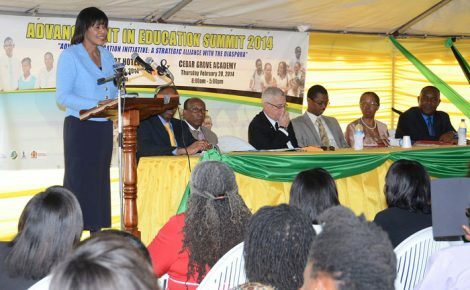 Regional Director in the Ministry of Education Region 3, Maxine Headlam, in her address, noted that the upgrading of the institution to a workforce college status is overdue and well deserved. “Since its inception in 1986, the institution has established a reputation of providing well-trained and competent personnel in a range of occupations in the hospitality industry. Graduates have made their mark locally and internationally in their professional conduct and in the process, they have won recognition for the institution”, she stated. She made mention of the partnerships that have been forged both locally and internationally, adding that this level of networking has resulted in “the cross fertilization of knowledge and ideas that is necessary for an educational institution that is serious about remaining relevant in the programme offering they provide”. She said that the Ministry looks forward to the institution continuing to produce skilled and competent persons to meet the demands of the local and international labour market. Keynote speaker at the function, Danville Walker, underscored the importance of partnership between the public and private sectors, arguing that this is necessary to eliminate mistrust between both sectors. 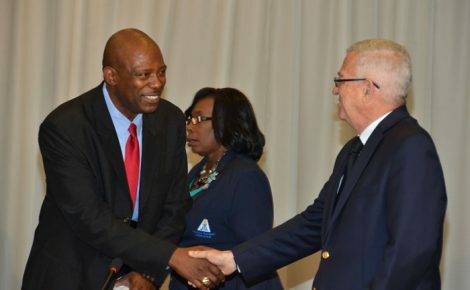 “We have to be mindful of what each of us needs to be able to able to succeed and work in partnership with each other…….it is important that the leaders in the private sector understand this and it is important that the leaders in the public sector understand this,” he stated.